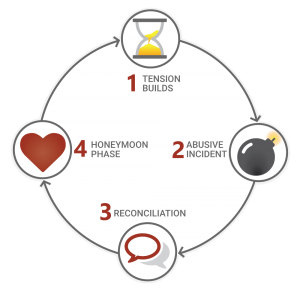 Domestic Violence or intimate partner violence is defined as a pattern of physical, sexual, and/or psychological abuse which is meant to control another person. Most often the people are intimate partners, but they may also be roommates, a boyfriend or girlfriend, an adult child who lives with his/her parents, or a parent who is abused by his/her adult children. CAPSA is the state and federally recognized domestic violence specialist serving Cache and Rich Counties. If you or someone you know has experienced or been impacted by domestic violence, please call CAPSA at (435) 753-2500 to speak with a caseworker and learn about options and resources available to help you. CAPSA can help you if you feel unsafe in your relationship or struggling to heal from abuse – the abuse could be current or happen when you were a child. Abuse manifests itself in many ways, including physically, emotionally, psychologically, financially, and sexually. CAPSA can help no matter the type of abuse or when it happened. CAPSA provides personalized services to help you and your children safely and permanently escape abuse. All services are FREE and confidential. Please call CAPSA anytime at (435) 753-2500 to speak with a trained advocate. Call 911 if you are in immediate danger. This abuse may cause injuries that can range from bruises and broken bones to permanent disabilities and even death. It does not include self-defense against the aggressive behavior of another individual. If you or someone you know has experienced or been impacted by physical abuse, please call CAPSA at (435) 753-2500 to speak with a caseworker and learn about options and resources available to help you. Sexual violence is often used in conjunction with physical violence and always includes emotional abuse, like coercion and threats. If you or someone you know has experienced or been impacted by sexual violence, call CAPSA at (435) 753-2500 to speak with a caseworker and learn about options and resources available to help you. If you or someone you know has experienced or been impacted by emotional or verbal abuse, call CAPSA at (435) 753-2500 to speak with a caseworker and learn about options and resources available to help you. If you or someone you know has experienced or been impacted by psychological abuse, please call CAPSA at (435) 753-2500 to speak with a caseworker and learn about options and resources available to help you. Stalking is a form of psychological abuse that goes beyond simply “following someone around.” Many stalkers will go to great lengths to track exactly where someone is, who she/he is seeing, and what she/he is doing. Stalkers are often proficient in advanced technology, and they use this to track or videotape their victims, listen to telephone conversations, and/or hack into someone’s computer to see what websites have been visited, e-mails have been sent, and any other activity that is taking place on that computer. Stalking may also occur in cases of domestic violence, when a person is stalked by his/her abuser. People who are stalked by a current or former intimate partner are at increased risk of being killed by that person. According to the National Center for Victims of Crime, 76% of women killed by an intimate partner were stalked by the partner before they were killed. If you think you or someone you know has experienced or been impacted by stalking, please call CAPSA at (435) 753-2500 to speak with a caseworker and learn about options and resources available to help you. Leaving someone for an extended period of time without food, water, suitable means of transportation, etc. These forms of neglect can cause physical and emotional trauma to the victim, and can eventually lead to death in severe cases. If you or someone you know has experienced or been impacted by neglect, please call CAPSA at (435) 753-2500 to speak with a caseworker and learn about options and resources available to help you. Financial exploitation goes beyond financial abuse because it involves not only taking control of another ‘s finances, but doing so by using a position of trust from an elder or vulnerable adult to gain access to and control over that person’s money and/or assets. If you or someone you know has experienced or been impacted by financial abuse or exploitation, please call CAPSA at (435) 753-2500 to speak with a caseworker and learn about options and resources available to help you.